A squint, also called strabismus, is where the eyes point in different directions. It's particularly common in young children, but can occur at any age. One of the eyes may turn in, out, up or down while the other eye looks ahead. This may happen all the time or it may come and go. Treatment is usually recommended to correct a squint, as it's unlikely to get better on its own and it could cause further problems if not treated early on. Your GP, health visitor or local opticians service can refer you to an eye specialist for some simple tests and treatment if necessary. Glasses – these can help if a squint is caused by a problem with your child's eyesight, such as long-sightedness. Eye exercises – special exercises for the muscles that control eye movement may sometimes help the eyes work together better. Surgery – this involves moving the muscles that control eye movement so the eyes line up correctly. It may be recommended if glasses aren't fully effective on their own. Read more about squint surgery. Injections into the eye muscles – these weaken the eye muscles, which can help the eyes line up better. But the effect usually lasts less than three months. If your child has a lazy eye as a result of their squint (read about possible further problems below), it may need to be treated first. Treatment for a lazy eye usually involves wearing a patch over the unaffected eye to help improve vision in the affected eye. It's important not to ignore a squint that happens all the time or occurs after three months of age. Surgery can help improve the alignment of the eyes even if a squint has been left untreated for a long time, but any vision problems may be permanent if they're not treated at a young age. The exact cause of a squint isn't always known. Some people are born with a squint and others develop one later in life. Sometimes they run in families. 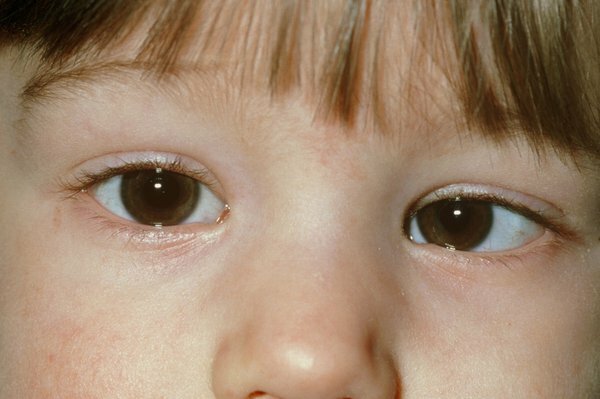 A squint can also sometimes be a symptom of a rare type of childhood eye cancer called retinoblastoma. Take your child to see your GP if they have a squint to rule out this condition.